If there are multiple paths in a single trace (separated by null(s)), it could be useful to have a different stroke-width for each path. This way, I could solve this issue, without having to draw a separate trace for each line. @cpsievert I'm not 100% convinced this is worth implementing. I think adding colorscale functionality to lines would make more sense. How does R handle this? Ooops, my bad, I thought this issue was asking for line.color array support. 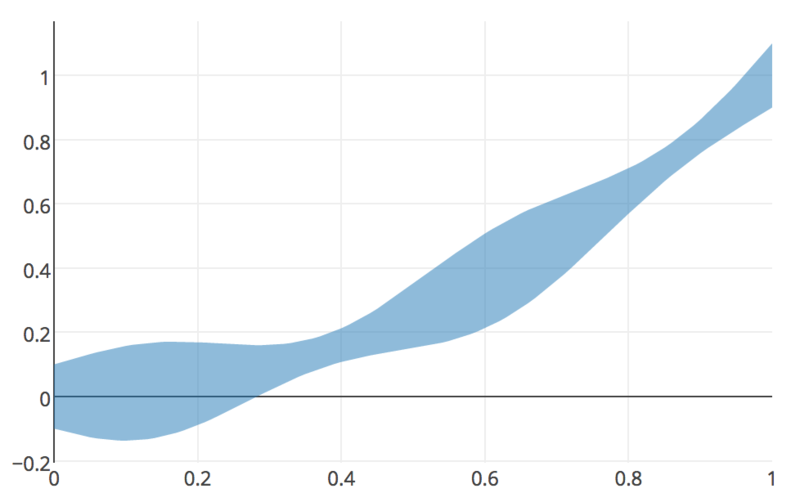 @cpsievert splitting trace data aroung null seems a bit magical to me. If other libraries do it, it might be enough to convince me though. @cpsievert keep the issue open. It's idea worth thinking about. The more I think about, the more I like this idea. But the problem is I tried to change the size of the edge between two nodes given the value in the similarity matrix but I didn't succeed it. I think my problem and this issue are linked. The loading issue is so significant that the Plotly Powerpoint addin can't display these graphs... I can't be sure but it seems like it just times out while loading. I get the error "Sorry, we had to restart [the add-in] because this add-in wasn't responding." Adding my support for this request - I am trying to do the same thing (variable Line width) using the plotly for R package. I have multiple paths in my data, separated by NAs to build (financial candlestick data), for which I'm trying to implement dynamic widths based on the volume in that bar (processed into Low, Medium, High categories). A variable color array option would also be great. For now, I'm going to create separate traces as suggested by cpsievert, as I only have 3 different width/color categories. However, this would become an issue if you had more potential width options. Also, it's not great should I wish to change the categories. Would the first segment get a width of 2 (the first in the segment)? 3 (the average)? To summarize, it just draws f(x) + width(x) from 0 to 1 and then walks back from 1 to 0 with f(x) - width(x) and draws it as a fill (i.e no lines). @cpsievert fwiw here's a slight extension that pulls out a couple more tricks to make hover work as if it's a normal trace. 😄 Doesn't handle multiple colors though. If we want to vary size/thickness of the lines using add_segments in plot_geo, is this currently not supported? I know we can do it in add_markers, but I'm wondering if there has been any update since this thread was created. We need size in lines too. it's even better if we can change the size on hover. 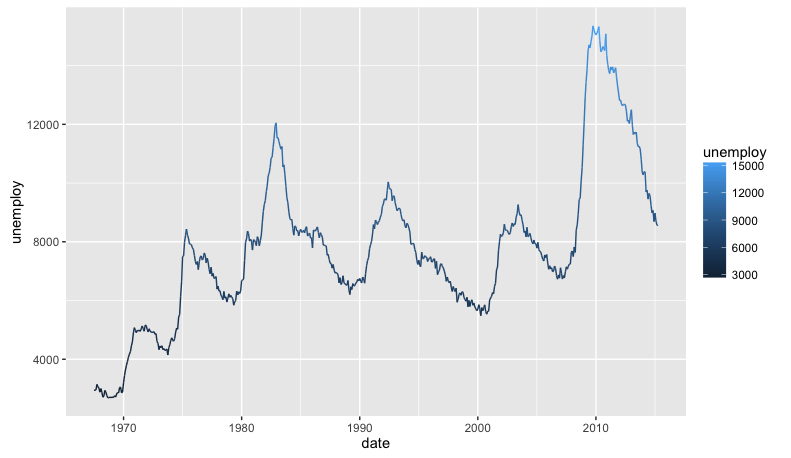 because sometime specially in time series analysis you need to highlight the line in context. color can seperate lines but on hover increase in size would make it much more easy. @vikram-rawat Just an FYI, I ended up using leaflet for now to vary the line thickness. It may be an option for you as well, but the lines don't look as pretty on a map though. I opened pull request related to that feature, could someone review it? @AlexVvx your AlexVvx#5 PR doesn't seem to be related to this ticket at all. In this ticket, we attempt to find an API to set the trace line.width per-segment (as opposed to only per-trace as currently). Has the color array feature been added? I'm not 100% convinced this is worth implementing. One reasonable and potentially important application for varied line style (both width and color) is the network graph (https://plot.ly/python/network-graphs/). The common use case is to use the line width and/or color to represent the weight of the connection, see e.g. this plot. Within the context of the network graph, it might perhaps be cleaner to introduce a different data type: an array of line segments. This would avoid the null hack in addition. Perhaps this belongs with #2876? Would be fairly natural there. @alexcjohnson you are absolutely right, thanks.